I want to share some of the exciting business applications Team VIVA and our early investors are working on within the VIVA project. These business models are intended to jump start the VIVA ecosystem with real world uses. VIVA is a unique blockchain project with a technical design that evolves beyond Proof of Work, Proof of Stake and Distributed Proof of Stake. 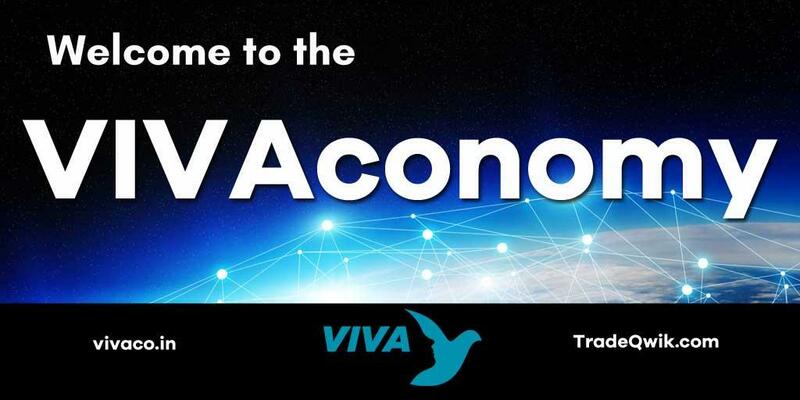 VIVA introduces a concept called Proof of Authority; a system that delivers instant transactions and seamless consensus. Our CTO, William Banks contrasts various models in his Game of Chains article published on Steemit. (1) But to summarize, Proof of Authority disposes of certain egalitarian notions involved in weaker consensus models and replaces them with cryptographic signature proofs and business contracts enforced by the network and also backed by the network. Our blockchain differs from run of the mill fare as well. Designed to be a multidimensional graph rather than linear like a traditional chain. Under this design the VIVA Network is more akin to neural networks, with linked, weighted, interconnected data and an optimizing mechanism which solves the NP hard "traveling salesman problem", in order to reroute the network into multiple optimal configurations depending the tasks required of it. By drawing from information in our Content Addressable Network (CAN), the VIVA ecosystem allows for a more robust and intelligent network. Rather than reinvent the wheel, VIVA takes advantage of hundreds of millions of dollars in research and investment by starting off with a custom fork of the powerful Hyperledger Fabric, which is backed by the likes of IBM and Intel. Our version is called Ultra Ledger. VIVA has a three-tier cryptocurrency model consisting of VIVA Crowns, VIVA Coins and market-pegged instruments we call vX which are tied to local fiat currencies for storing value like vUSD, vMXN or vEUR, etc. VIVA Crowns are an indivisible digital asset secured by the best cryptography available. They grant the owner rights to access the network, operate a business referred to as a mint, and receive a Treasury Right (TR) every 90 days to mint a share of the total VIVA coins allotted within that quarter. A mint can be thought of as a hybrid between a master node and a mining pool. A mint can do any businesses activity except minting VIVA Coins to sell on the open market. By having funds first flow through a business activity it helps to put a breaking pressure on supply growth and thus increases the value and utility of each coin minted. In the VIVA world we do not mine coins, we mint them. Our VIVA Crown holders hold the key to exclusively mint new VIVA coins into the market. The supply is set by Crownholders every 90 days and is a mechanism to keep the price of VIVA Coin orbiting around a price target. Currently this target is $5.50 +-10%. Crown holders who do not operate a mint can sell their quarterly Treasury Rights to other mints who need them to cover their operational expenses. VIVA Crowns are the drivers of our economy. VIVA Crowns are extremely rare. There will only be a total of 10500 Crowns available with the ICO, with only one Crown discoverable per week after that. No more than 42,000 Crowns will ever be issued. To date, 4000 have been issued to early investors and developers; 6500 new Crowns will be offered during our ICO beginning May 1st, 9am PST. The ICO will conclude on May 21 at 11:59 PST or when all Crowns are sold. Crowns will begin at a price of 200 VIVA, with prices increasing by 1 VIVA for each subsequent Crown. and Votabit, our solution for global election fraud through open source voting systems. An overarching goal of this project is that participating worker nodes have the potential to earn a living income with just a backgrounded application running on their computer. Powered by the VIVA Network. TradeQwik is the crypto/fiat exchange and the primary gateway in and out of the VIVAconomy. As the first operating mint on the evolving VIVA Network, it is currently live, in beta, and you can sign up at www.TradeQwik.com . As Team VIVA prepares for our debut and ICO on May 1st, TradeQwik is polishing the platform which will serve as the staging ground for the VIVA ICO. The TradeQwik exchange is the official wallet of both VIVA Crowns and VIVA Coins. Post-ICO the developers of the VIVA Network will be releasing individualized VIVA wallets in several languages including Spanish, German, and Russian. All transactions on TradeQwik are done using the network's token VIVA Coin. Current exchange pairs being offered for trading are Bitcoin, Litecoin, Ethereum, Steem, Dash, Golos, XAU/GBG (mg. gold), USD and MXN. By the time of the ICO, TradeQwik plans to have all of the top ten marketcap coins listed on the exchange for seamless trading into and out of VIVA. Cashola is a peer to peer payment system that utilizes SMS text messaging instead of apps. With funding from the ICO, we will be getting money transfer licenses in place allowing our Network to take a slice of the trillion dollar remittance industry without over complicating it for new users. This solution is based on the fact that many people throughout the world do not have smart phones or reliable internet but they do have cellular service. MedicAxess is an application that will be a game changer in the medical industry. Our initiative is to have all medical records tied to the individual rather than scattered between medical clinics, hospitals, labs, and care providers. Individuals will be empowered to control who has access to their records when they seek medical care. The unique thing about MedicAxess is that all medical providers will be allowed to store medical records safely on the network for free. There is a small fee charged when retrieving records and this fee must be paid in VIVA, thereby setting up a way for people to offset their medical bills with VIVA earned by donating their computing resources to help others. POETS, an acronym for Proof of Educational Transcript System, is an exciting application for higher education. What differentiates POETS from other proposed blockchain-backed open course-ware initiatives is that all courses will be from accredited institutions. A condition of institutional participation requires that credits be considered fungible between participating institutions. In short this means that students are allowed to cherry pick courses and instructors from a myriad of institutions taking only the very best, and most rigorous courses, then banking these credits over a lifetime. The student may “cash them in” when they feel they are degree ready and the issuing institution agrees. This is a sea change in the way education is handled at the student level. Students become life-long learners and demonstrate this competency with a full transcript which is as mobile and fluid as the individual. Votabit is our solution to global election fraud and a move to more direct democracy throughout the world. Votabit will first be a platform where citizens store their electronic digital signatures for occasions which call for signing local referendums, recalling elected officials not doing their job, and direct impact on the policies shaping their communities. Plans also include offering open source voting systems that will be sold to states and government actors moving to provide time-stamped, secure, transparent elections backed by blockchain technology. These projects are just the tip of the iceberg that are road-mapped for just FY1. We have more in the works and just want to show you a few of the cards we're holding right now. OUTSTANDING! AMAZING! GREAT! WOOT WOOT! WHAT A GEM IN THE CRYPTO SPACE! By the way, why is it that you have to sign-up before you can download your whitepaper? What if, I don't want to sign-up and just want to check your whitepaper first? And yes, there's too much words in your OP. Not all people here has the patience to read and understand all the essays that you wrote. I wanted to put in images, but it seems maybe because I am new to the forum that I can't just yet? Here is a clean link to the whitepaper with no signup required. We have a series of articles that we send, because most people have different questions and we are engaging in educating through a series of content pieces with the signup. Thanks Alec Hahn for responding, he is also one of our founders. Hi sir I would like to do Vietnamese translation for this project, Pm me if I'm accepted thanks. Just wanted to share the great coverage we garnered with NEWSWEEK Espanol about Bitcoin and VIVA in Mexico ;-) I couldn't have asked for better support from this country! Sorry that link does not highlight, I tried a url shortener link too, it was removed as suspicious. Guess this site prevents me from doing that too :-/ I trust you all can copy/paste a link if you are interested. And yes working on bounty announcement. Thanks for staying tuned! This project is for me! What would be the initial ICO price? reach since only one Crown is created each week. rented or sold to a mint of your choice. been sold, whichever comes first. a Treasury Right, aka TR. The Viva project already exceeded my expectation. I never thought development would be so fast.Really good job for everyone involved! The price of Crowns will start at 200 VIVA, which is around $1,000 USD. We have mechanisms in place to keep VIVA stable, and orbiting around $5.50 USD. Hi Dev. Very interested in your project. I would like to know whether the bounty of the company?